Hollco takes the idea of “trustiness, harmonious, efficiency, learning, innovation and development" to provide the top-grade products with service for customers. 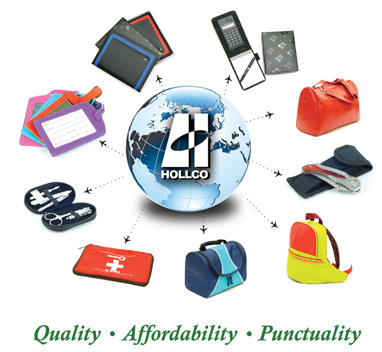 Hollco fully owns and operates 4 state-of-the art factories in the Guangdong Province of China, each specializing in a particular product area: The factory located in Shudne specializes in document portfolios and business gifts, the Dongguan factory is a specialist in luggage, sports bags, rucksacks and cooler bags, while the factory in Yangjiang and Yangdong excels in the manufacture of smaller products such as wallets, key-purses, CD holders, manicure sets and knifes sets. Each factory has on experienced in-house printing department for silkscreen printing or embossing of customers’ custom designs and corporate logos. A wide range of materials are on hand, from 70D to 420D PVC, Nylon, polyester, PU based materials, cotton, canvas and leather. Volume purchasing of these materials allows Hollco to achieve economies of scale in production, which is reflected in lower overall prices. Through many years of development, our company has become a large-scale enterprise with research, production, assembly and marketing capabilities. Our products are distributed all over the world. Members of Hollco International (Holdings) Ltd.
Dongguan Hollco Bags Manufacturing Ltd.
Shunde Pronto Manufaturing Co. Ltd.
Yangdong Hollco Metal Manufacturing Ltd.
Yangjiang Jie Da Wallet and Metalware Products Co. Ltd.